It is a specific-purpose product line, which is designed to make the development of custom IoT gateways or commercial/industrial products easier. For engineers, IoT-makers or entrepreneurs, things can be done quickly without concern about hardware/mechanical design. This product line is equipped with RS232/RS422/RS485 ports, which allows users to collect data from serial devices. Users can pre-process data before sending it over the Internet, and vice versa. Some of products are equipped with relays and dry/wet contacts, which can be used to control/monitor ON/OFF state of high-voltage devices. This product line comes along with a solid case and industrial hardware specifications, helping reduce manufacturing process. 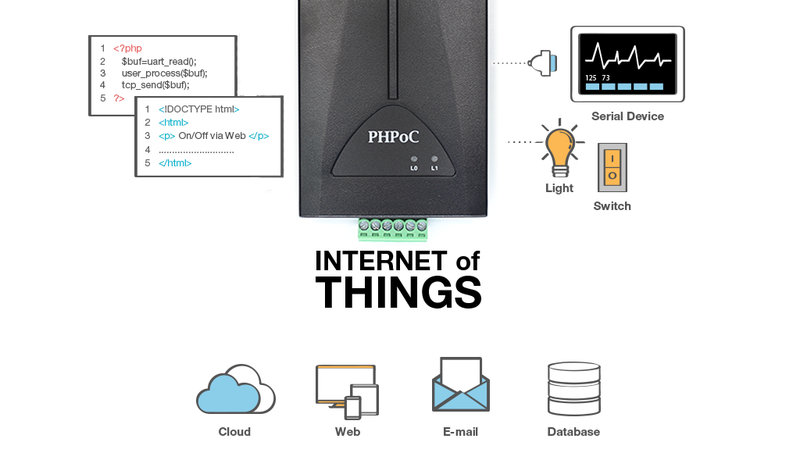 PHPoC IoT Gateway has both Ethernet and Wi-Fi connectivities. It supports various network protocols (IPv4/IPv6, TCP/UDP, ICMP, DHCP, HTTP, SSH, SMTP, ESMTP, DNS, DDNS, MySQL ...), security protocols (WPA-PSK / WPA2-PSK, WPA-Enterprise(TLS/TTLS/PEAP), SSL/TLS) and encryption algorithms (AES, SEED, RC4, 3DES). Equipped with the Web server and WebSocket server, PHPoC IoT Gateway enables users to develop the real-time embedded Web application. It is integrated with PHPoC interpreter, making it easy for users to interact with peripherals and create the dynamic embedded Web application. With a solid case equipped and industrial operating conditions featured, PHPoC IoT Gateway allows users to develop industrial IoT products without concern about hardware/mechanical design. Who can use PHPoC IoT Gateway? Engineers and IoT-makers can use this product line to quickly create the commercial devices without requiring manufacturing process. They just need to develop the source code and upload to the devices.